A header displaying information about the next event. The white circle represents an image. A menu with buttons used to switch between different content categories (in this case they are labelled “UPCOMING” and “PREVIOUS”). An area displaying a list of events belonging to the selected category. Swiping up on the event list pushes the header view up until it’s completely invisible, as seen in the third screenshot. At that point, if the event list can’t display all its elements, the content scrolls further with the “UPCOMING/PREVIOUS” bar staying at the top of the screen. Swiping left or right lets the user switch between the lists of upcoming or previous events (this can be done at all times, no matter if the header view is visible or not). How do we satisfy all of the above-mentioned requirements? My first thought was to simply use one table view, but that is not going to work. The reason is the need for horizontal scrolling between multiple lists of events. If we were to use a single table view, we would have to put them all in a table view cell, which is not what it was designed for. On top of that we would encounter problems with handling touches, due to the fact that we’re embedding a scroll view inside another scroll view. This is not going to work if both of them support scrolling along the same axis. Both the header view and the SlideMenuController’s view are subviews of the HomePageViewController’s view. The only outstanding problem is making sure that the header view moves up as we swipe up on the event list. This is the part that was tricky to get right. What we need to do is resize SlideMenuController until it fills the whole screen. If there is still more content to be shown, we have to make sure that the currently visible table view gets a chance to scroll its content. The header view should always stay above the menu view and be eventually pushed off the screen. Our solution should have the same smoothness of scrolling as a standard UITableView, even though we transition from resizing to regular scrolling. You can find my implementation of SlideMenuController here. ScrollViewDidScroll informs us that a child scroll view at a given index (for example the one representing upcoming events) was swiped vertically. 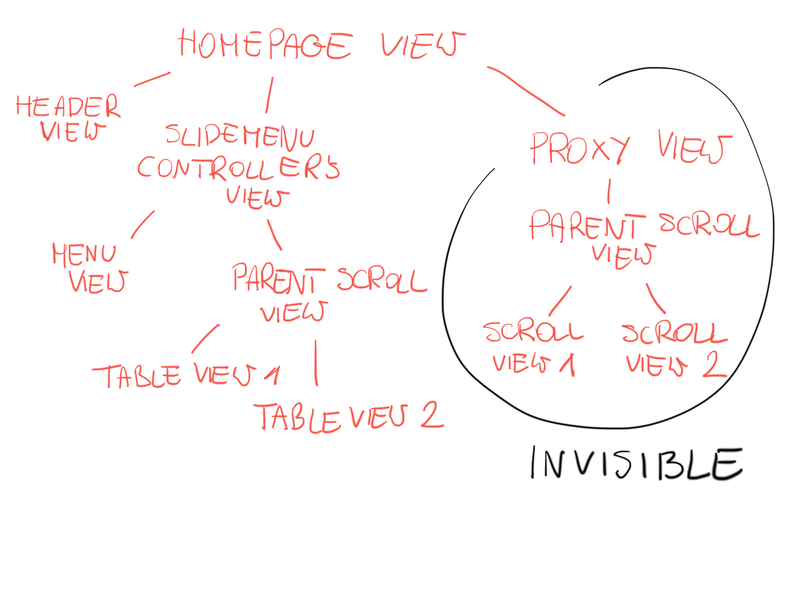 ParentScrollViewDidScroll tells the delegate that the user swiped horizontally, which is used to switch between child scroll views. The last method is for handling interactions with other UI elements visible on the screen, like buttons and table view cells. The class implementing IProxyViewDelegate is typically the view controller whose view contains an instance of ProxyView. The view controller makes sure that the interactions performed on the invisible hierarchy of scroll views is reflected on its visible counterpart in the form of SlideMenuController. If you would like to take a look at how ProxyView is implemented, you can find the code here. The challenge we were dealing with was to implement a view controller, which will allow us to display multiple lists of items. The user should be able to switch between the lists by swiping horizontally. Each list can also scroll vertically, which causes it to fill all the available space on the screen and push the header view out of sight. 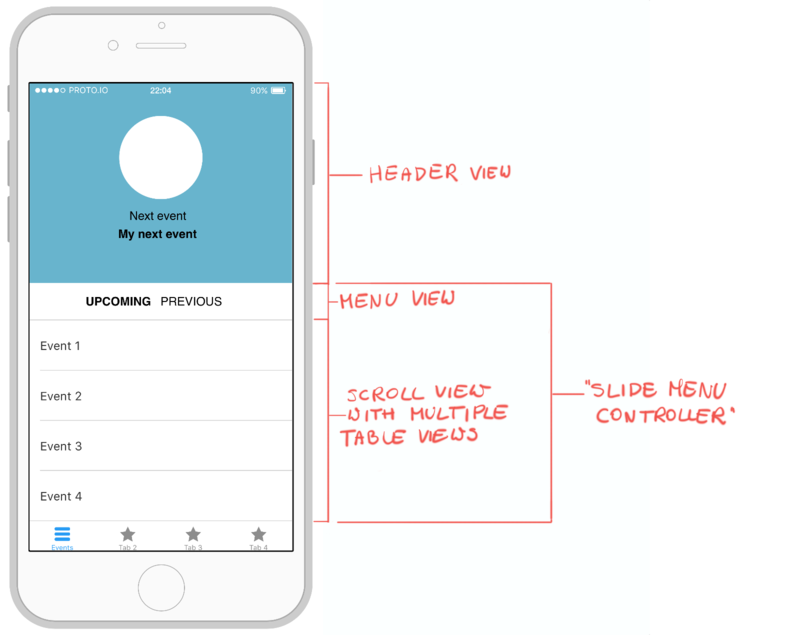 We achieved our goal by implementing a custom subclass of UIViewController, which manages a scroll view containing multiple instances of UITableView. To make sure that the user’s interaction with the new custom controller is smooth, we implemented a proxy view. Its purpose is to translate swipe gestures into resizing of SlideMenuController and scrolling of the currently visible table view.